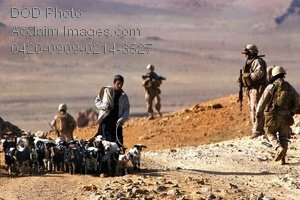 Description: Free, public domain image: An Afghan Boy Walking a Herd of Goats With American Marines Sweeping for Explosives. .jpgGOLESTAN, Islamic Republic of Afghanistan – An Afghan boy walks his herd of goats along a road that Marines sweep for improvised explosive devices in Golestan, Farah Province, Islamic Republic of Afghanistan, March 12, 2009. The Marines with the second platoon of Company K, 3rd Battalion, 8th Marine Regiment (Reinforced), the ground combat element of Special Purpose Marine Air Ground Task Force – Afghanistan, serve in Golestan to conduct counterinsurgency operations, with a focus on training and mentoring the Afghan National Police. The Marines routinely sweep the roadways to provide the people safe passage through the city’s valley. (Official U.S. Marine Corps photo by Lance Cpl. Brian D. Jones.